It takes a comic spark plug touched with brilliance to pull off the kind of tour de force that the aniacally exuberant singer, pianist and cutup Mark Nadler has brought (through Jan. 25) to the Firebird Upstairs Supper Club, the opulent new cabaret atop the Firebird restaurant at 365 West 46th Street. In keeping with the club's jewel-box décor and rich Russian cuisine, Mr. Nadler is performing his one-man show, "Tschaikowsky (and Other Russians)," a zany tutorial in modern Russian music spun off from one of the greatest patter songs ever written. That song, "Tschaikowsky (and Other Russians)" became an instant classic when introduced by Danny Kaye in "Lady in the Dark" in 1941. With music by Kurt Weill and lyrics by Ira Gershwin, this torrent of tongue-twisting verbiage drops the names of 49 composers, from Malichevsky, Rubinstein and Arensky to Gretchnaninoff, Kvoschinsky and Rachmaninoff during its mad dash to an imaginary finish ine. Those names, even the most esoteric ones, are not imaginary. As Mr. Nadler's show careers wildly along, he offers tiny musical fragments along with instant analyses (and in some cases personality profiles) of a good number of those 49. In between, he makes fanciful leaps of connection between his research and a dozen first-rate songs by composers, from Rodgers and Hart to Adam Guettel to John Wallowitch. Kurt Weill and Ogden Nash's "I'm a Stranger Here Myself," for instance, is connected to "Stranger in Paradise," adapted from a melody by the Russian composer Borodin, whom Mr. Nadler tells us was an extraordinarily nice guy. comedian, was a sly, suave prankster, Mr. Nadler is a raucous, excitable vaudevillian descended from Al Jolson. Mr. Nadler doesn't tease the emotions. With his ferocious pianism and crowing delivery, he is a traditional show-biz virtuoso of what might be called the hard sell. When he's on, he's "on." But musical legerdemain is now being repeated nightly by a nimble Jack-n-the-box named Mark Nadler in a winning new cabaret show called—what else?—Tschaikowsky (And Other Russians) that’s heating up a cold January like Dr. Zhivago’s samovar. Appropriately, Mr. Nadler’s show has found the perfect showcase. He is inaugurating a brand-new cabaret room in the swell digs above the Firebird restaurant on West 46th Street. With its gilt-edged crown moldings, red walls of moiré silk, paintings of prancing, half-clad scarf dancers from Diaghilev ballets, and a centerpiece chandelier clamped to the ceiling with a chain, "kitsch" may b e a better word for the new Firebird Club than "elegant." But it’s the ultimate setting for Stravinsky, Rumshinsky, Mussorgsky and dozens of other Russians who pepper Mr. Nadler’s act. This is not a run-of-the-mill cabaret act for dopes. Mr. Nadler expects his audience to bring along a bit of knowledge already. "If you can afford this cover charge," he informs the audience, "I probably don’t have to tell you who Piotr Ilyich Tchaikovsky is." Let the fireworks begin! Thisamazing feat of research and chutzpah may sound like an impossible task bordering dangerously on tedium, but Mark Nadler is a musical Punchinello who pulls more rabbits out of a hat than the teenage Houdini. Talented and fearless, he never runs out of fresh ideas, and he has the wacky style and infectioushumor to pull them off. Tackling an entertainment project this cheeky and daunting, I think he may also be a little bit crazy. That’s the best part. In an otherwisedreary season of predictable revivals and ho-hum reruns, Mark Nadler an original. Mad joy is his signature, but I like the way he spreads it around. From the second he bounds onto the stage of the beautiful new FireBird Upstairs Supper Club, at 365 W. 46th St., Mark Nadler exhibits a spellbinding manic energy. 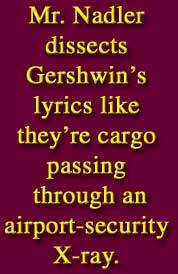 Entitled "Tschaikowsky (and Other Russians)," his act begins with the 1941 Ira Gershwin/Kurt Weill song with the same name, whose lyrics incorporate the names of 48 largely obscure Russian composers. Nadler, who has a rich voice, rips through it at requisite breakneck speed, then sets out — only half-facetiously — to explain who all these composers were. Since he is also a splendid pianist, he plays musical examples that often suggest these composers should not be obscure. Sometimes the musical illustrations are wittily absurd — like his demonstration that if you play the notes of Rimsky-Korsakov's "Flight of the Bumble Bee" as chords, they resemble those his pupil Stravinsky used in "Rite of Spring." Often the "musicology" is merely a pretext to sing. Discussing Tchaikovsky's loneliness, for example, he launches into a tender version of Frank Loesser's "Ugly Duckling," which he interlards with passages from "Swan Lake." The act goes far beyond its ostensibly giddy premise. I hesitate to say it has an intellectual subtext, because I don't want to frighten anyone. Nadler's premise is that the artists we remember are those who take risks. To prove it, he sings works by a wild range of composers, from Vernon Duke to Adam Guettel to the too-little-known John Wallowitch — all with deep resonance. He even does Stephen Sondheim's "Next," from "Pacific Overtures," which I never expected to hear in a nightclub. What Nadler demonstrates is that great cabaret is really theater, stimulating and exhilarating, outrageous and hilarious. In 1941 Danny Kaye became an overnight sensation in "Lady In The Dark" when he stopped the show cold singing Kurt Weill’s and Ira Gershwin’s, "Tchaikowski (and Other Russians)", a list of forty-eight Russian composers rattled off at break-neck speed. In his new show, Tschaikowsky (and Other Russians), award-winning entertainer, Mark Nadler, deconstructs this song by examining each of these composers -- sometimes briefly, sometimes at length. These examinations take us to songs like "I Can’t Get Started", "I Concentrate On You", "The Ugly Duckling" (infused with "Swan Lake") and eleven other great American songs. The material ranges from standards to new works by Adam Guettel, (the grand-son of and heir apparent to Richard Rodgers) and Carol Hall, (the composer/lyricist of "The Best Little Whorehouse In Texas".) 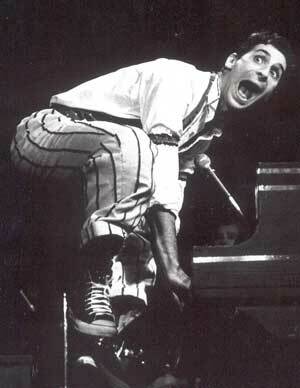 The show features high comedy, virtuosic piano playing and Mark even does a touching and thrilling softshoe while accompanying himself at the piano to "Very Soft Shoes", (from Once Upon A Mattress). Because of all of the biographical and historical information discussed in the show, it is extremely educational without ever losing its firm foot-hold in entertainment. Tchaikowski (and Other Russians) is extremely funny and tuneful and yet, is also a serious examination of the nature of fame and legacy. By the time the show concludes with Mark singing the song, "Tschaikowsky (and Other Russians)" while playing, simultaneously, a bit of music by each of the composers, (including Rachmaninoff, Stravinsky, Prokoviev, Rimsky-Korsakov and of couse, Tschaikowsky), the audience is on their feet cheering. The art of cabaret is often considered to have reached its height when a gifted singer performs great songs with sensational arrangements. Well, cabaret also achieves something akin to perfection when a musical comedy madman named Mark Nadler takes on the famous patter song "Tchaikowski" (Kurt Weill/Ira Gershwin) and then proceeds to create a comically brilliant show in which everything flows from the wellspring of the act's title tune. The act begins with Nadler's performance of "Tschaikowsky," which was one of Danny Kaye's signature songs. It's a blazing opener that sets the stage for Nadler's extraordinary conceit. After singing the song, he notes that people always ask him how he remembers the lyrics, a wild and woolly string of the names of approximately four dozen Russian composers, ranging from the famous to the footnote. He replies that it's easy if you know who the Russian composers are. With that, he launches into a generous one-hour plus act in which he identifies the reason -- musical and/or personal -- why each composer was included in the song. If this description makes the show sound academic or esoteric, let us assure you that it is anything but. nothing is sacred to Nadler except laughter, and he sings and sasses his way through these Russian composers (and their relationship to Ira Gershwin's lyric) with more relish than you'll find at Nathan's. placing them in the continuum of music that followed "Tschaikowsky." Nadler is a performer for whom the word "Big" was invented. Nonetheless, he can be delicate when the music calls upon him to be so. And while his voice isn't the prettiest instrument in cabaret, it is surprisingly expressive. Despite his well earned reputation for edgy, in-your-face humor, he can also do a wonderful job with a passionate ballad. It is, in fact, his ability to modulate his performance style that keeps the driving narrative of this show from exhausting the audience. Nadler packs an amazing amount of research into the act but tosses it off with the brio of a performer who is confident that he will always have more ascinating nuggets of information to impart, better musical examples to make his points, and ever more wonderful songs to sing. That confidence is well-earned. If anything in the world of New York nightlife is remotely comparable to Nadler's show, it is Rob Kapilow's entertaining deconstruction of standards for Lincoln Center's American Songbook Series. Kapilow will be at it again on November 15 with a Bernstein program featuring performances by Brian d'Arcy James and Ana Marie Andricain, at the Kaplan Penthouse. This is exactly where Mark Nadler's Tschaikowsky (and Other Russians) should be playing next year; it is a first cousin to Kapilow's concept, but from the loopy side of the family. Nadler's show is a natural for the Lincoln Center series because it's a graduate level course on the Great American Songbook and its antecedents, as well as one of the most inspired and entertaining musical comedy acts of this or any other year.